A fine stainless steel Rolex Explorer I self winding wristwatch. With box and certificate. A fine stainless steel Rolex Datejust II self winding wristwatch. Blue Dial. With box and certificate. A fine stainless steel Rolex Explorer II self winding diving wristwatch, with two time zones. With box and certificate. A fine stainless steel Rolex Yachtmaster self winding diving wristwatch. With box and certificate. Fine and rare Rolex Gmt Master stainless steel self winding wristwatch with 2 time zone. With Box and certificate. A fine yellow gold Rolex daytona chronograph, with six inverted dial. With box and papers. A fine rose gold Rolex Day-date selfwinding wristwatch with diamond index. With box and papers. Fine rose gold Patek Philippe manual winding wristwatch. Fine rose gold Patek Philippe Calatrava manual winding wristwatch, with box and certificate of origin. Fine white gold Patek Philippe Calatrava self winding wristwatch, with box and certificate of origin. Fine yellow gold Patek Philippe self winding travel time wristwatch, with box and certificate of origin. Fine rose gold Patek Philippe manual winding travel time wristwatch, with certificate of origin. Fine rose gold Patek Philippe annual calendar self winding wristwatch, with box and certificate of origin. Fine and rare rose gold Patek Philippe Annual Calendar self winding wristwatch. With box and certificate. Fine and rare yellow gold Patek Philippe Perpetual Calendar manual winding wristwatch. With box and extract from the archives. Rare stainless steel Patek Philippe Nautilus self winding wristwatch. With box and certificate. 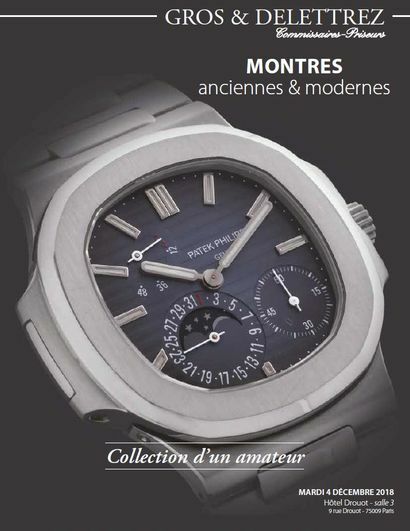 Rare stainless steel Patek Philippe Nautilus self winding wristwatch, with moon phase and power reserve. With box and certificate. Rare stainless steel Patek Philippe Nautilus Annual Calendar self winding wristwatch. With box and certificate. Rare stainless steel Patek Philippe Nautilus travel Time self winding chronograph. With box and certificate. Rare stainless steel Patek Philippe Aquanaut Travel Time self winding wristwatch. With box and certificate. A fine yellow gold Breguet Tradition manual winding skeleton wristwatch. With box and certificate. A fine white gold FP Journe manual winding «Chronomètre à résonance» wristwatch. With box and certificate. Fine thine rose gold Audermars Piguet Royal Oak self winding wristwatch. With box and certificate. A fine limited edition stainless steel Omega Apollo 11 manual winding chronograph. With box and certificate. A fine limited edition stainless steel Omega Apollo 17 manual winding chronograph. With box and certificate. Fine stainsless stell Tudor black Bay self winding divind watch. With box and certificate. A fine rose gold Zenith El Primero self winding chronograph. With box and certificate. A fine stainless steel Zenith Stratos manual winding chronograph. With box and papers. A fine stainless steel Pvd Hublot Commando limited Edition self winding chronograph. With box and papers. A fine stainless steel Hublot Tour Auto limited Edition self winding chronograph. With box and papers. A titanium Zenith Tourbillon self winding chronograph. With box and papers. A stainless steel Heur Autavia self winding chronograph. With box and papers. A stainless steel Heur Autavia Jack Heuer Limited Edition self winding chronograph. With box and papers.